Ultrafast highly-dispersive mirrors are critical for pulse compression and dispersion compensation in ultrafast laser applications. Ultrafast lasers emit extremely short pulses with durations of picoseconds, femtoseconds, or attoseconds, and, due to the Heisenberg uncertainty principle, transform-limited pulses reaching their lower limit for pulse duration have a wide bandwidth covering a considerable wavelength spread (Figure 1). Dispersion of this wide bandwidth as it transmits through optical media, such as objectives, windows, or lenses, stretches out the pulse duration of ultrafast pulses, making dispersion compensation an important part of ultrafast laser applications. Dispersion: What is it and Why Does it Matter? Chromatic dispersion describes the dependence of the phase velocity (or speed) of light in an optical medium on its optical frequency or wavelength. Most materials used for optical components exhibit positive dispersion, meaning that longer wavelengths will have a higher phase velocity than short wavelengths (Figure 3). This elongates the pulse duration of ultrafast pulses in a process known as positive chirp, which is detrimental in ultrafast applications. However, this can be compensated by optical components, such as multilayer dielectric mirrors, that feature negative dispersion, in which shorter wavelengths have a higher phase velocity than long wavelengths. This balances out the positive dispersion that occurred earlier in the system, resulting in pulse compression for optimal performance (Figure 4). When considering how dispersion affects ultrafast laser systems, it is necessary to understand group delay and group delay dispersion (GDD). The group delay of an optical component is the derivative of the change in the phase of the electric field of the radiation with respect to its angular frequency. GDD is defined as the derivative of the group delay, or the second derivative of the spectral phase, with respect to frequency. The GDD per unit length is known as the group velocity dispersion (GVD). GDD is typically given in units of fs2 while GVD is given in units of fs2/mm. Pulse compressing optics typically have a negative GDD with a large magnitude in order to compress positively chirped pulses. For more information on dispersion and GVD, please read our Dispersion application note. To understand how ultrafast highly-dispersive mirrors function it is important to understand two other types of mirrors: Gires-Tournois interferometer (GTI) mirrors and chirped mirrors. GTI mirrors utilize resonance to provide angle-dependent negative GDD for intracavity dispersion control in ultrafast lasers. However, GTI mirrors provide negative GDD over a very limited bandwidth and introduce some high-order dispersion. On the other hand, chirped mirrors provide a controlled negative GDD through the wavelength dependent penetration depth of the laser pulse. The layer thicknesses in their dielectric coating increase as light penetrates into the coating. This causes shorter wavelengths to have shorter penetration depths into the coating than long wavelengths, essentially allowing long wavelengths to “catch up” to short wavelengths and experience a larger group delay (Figure 5). However, in these simple multilayer dielectric structures, the discrete switching between different layer thicknesses leads to oscillations in the GDD as a function of wavelength, similar to the oscillations experienced in a Febry-Perot resonator. Ultrafast highly-dispersive mirrors counter this issue through the combination of wavelength-dependent penetration effect, similar to that of traditional chirped mirrors, and a multi-resonance effect knows as multi-GTI.3 This optimized combination of penetration and resonance effects allows higher GDD values and low loss over broad bandwidth without increasing the thickness of the multilayer coating structure. 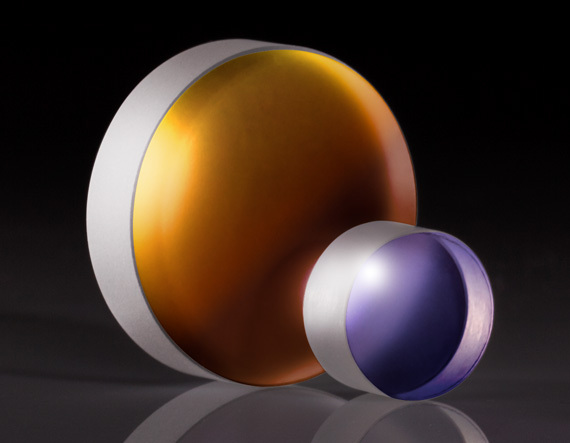 Traditional pulse compression optics, such as gratings or dispersive prisms, could also be used for ultrafast pulse compression and dispersion compensation. However, highly-dispersive mirrors are more advantageous due to their compact size, low loss, and negative GDDs with large magnitudes over a large bandwidth (Figures 6 and 7). They are used for all-mirror, alignment-insensitive pulse compressors that compensate for GDD as well as third- and high-order dispersion. Typical chirped pulse amplification (CPA) lasers, which amplify ultrafast pulses to high optical peak intensities while preventing excessive nonlinear pulse distortions or damage to the gain medium, rely on stretching and compressing pulses before and after amplification. 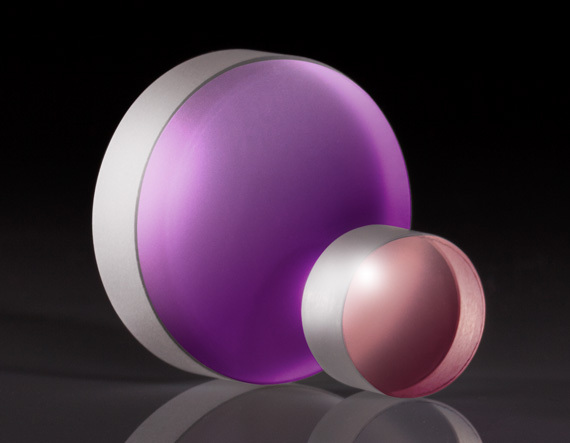 Therefore, compressive optics such as ultrafast highly-dispersive mirrors are decidedly important for CPA lasers. 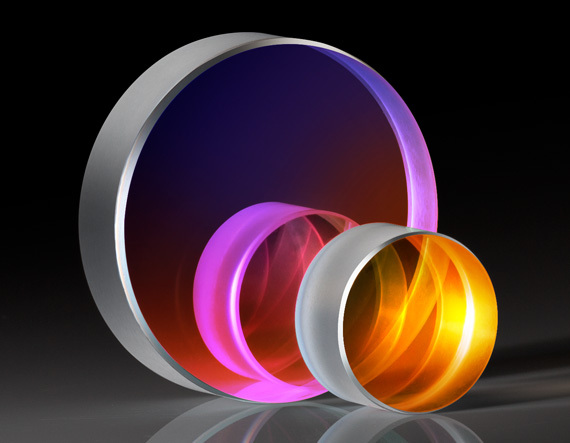 Edmund Optics® (EO) offers a variety of different ultrafast highly-dispersive mirrors for different common ultrafast laser wavelengths. 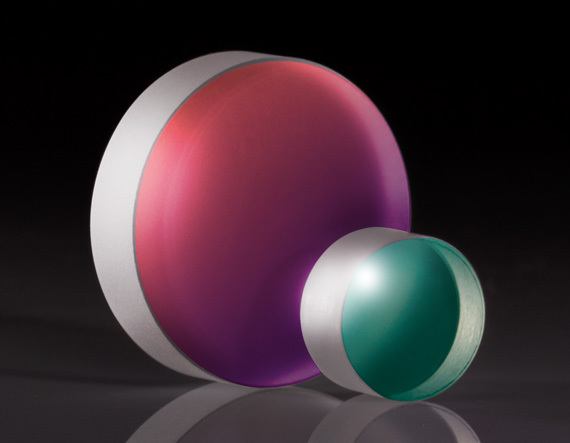 800nm Highly-Dispersive Ultrafast Mirrors feature a multilayer ultrafast chirped coating and a GTI coating to achieve a GDD of -1300fs2 at 5° angle of incidence (AOI) and >99.8% reflection (p-polarization) between 730-830nm. The highly-dispersive coating design provides control of third and higher order dispersions with high beam stability. 1030nm Highly-Dispersive Ultrafast Mirrors offer a GDD of -1000 fs2 at a 7° angle of incidence (AOI) and >99.8% reflection (p-polarization) across a 60nm bandwidth, making them optimal for Yb:doped fiber laser pulse compression and dispersion compensation. 1030nm Highly-Dispersive Broadband Ultrafast Mirrors feature a GDD of -200 fs2 at 5° AOI and >99.8% reflection of p-polarization between 950 - 1120nm. They are optimal for pulse compression and dispersion compensation of ultrafast near infrared (NIR) lasers including ultrafast Yb:doped fiber lasers. 2μm Highly-Dispersive Broadband Ultrafast Mirrors are ideal for intracavity dispersion compensation and 99% reflectivity from 2000-2200nm. 1. Mielke, Michael. "Ultrafast Lasers: Ultrashort Pulse Lasers Bring Cost-Efficient Precision to Micromanufacturing." Laser Focus World, 8 Apr. 2015. 3. Pervak, V., et al. "High-Dispersive Mirrors for Femtosecond Lasers." Optics Express, vol. 16, no. 14, 2008, pp. 10220–10233., doi:10.1364/oe.16.010220. How does group delay dispersion (GDD) relate to first order and higher order dispersion? For a detailed description of dispersion and GVD, please read our Dispersion application note. Why do ultrafast highly-dispersive mirrors have such low angles of incidence (AOIs)? The low AOI of ultrafast highly-dispersive mirrors allow for reflections between multiple mirrors, so several mirrors will be used at once for maximum dispersion compensation and pulse compression. Do the short pulse durations of ultrafast lasers impact the laser induced damage threshold of ultrafast optics? Yes, short ultrafast pulses interact with optical coatings and substrates in a way that is different from other laser pulses, leading to different damage mechanisms. For more information, please read our LIDT for Ultrafast Lasers application note.